Dimensões desta antevisão: 456 × 599 píxeis. Outras resoluções: 183 × 240 píxeis | 365 × 480 píxeis | 457 × 600 píxeis | 585 × 768 píxeis | 1 153 × 1 514 píxeis. 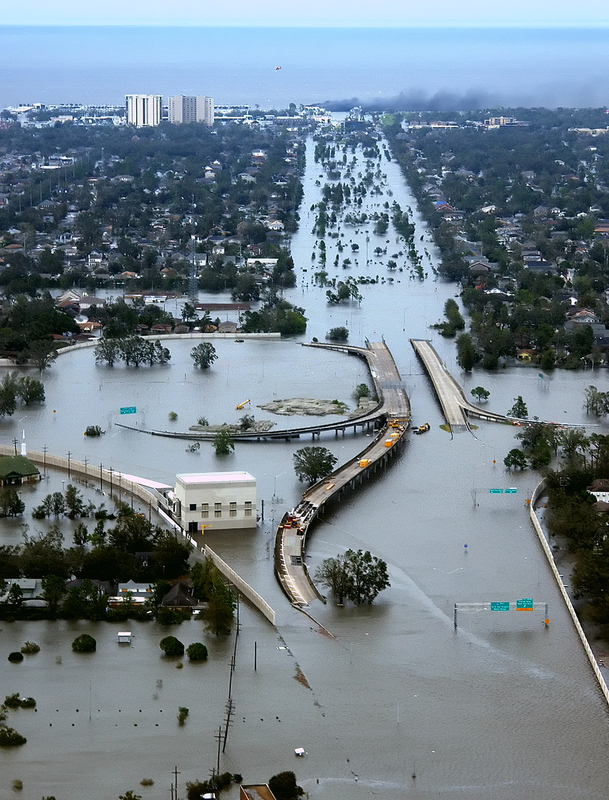 English: New Orleans, Louisiana in the aftermath of Hurricane Katrina (2005:08:29 17:24:22), showing Interstate 10 at West End Boulevard, looking towards Lake Pontchartrain. The 17th Street Canal is just beyond the left edge of the image. The breach in the levee of that canal was responsible for much of the flooding of the city in the hours after the hurricane. In the foreground, the intersection is the juncture of I-10, running from the bottom of the photo and curving out of the photo to the left, with the western end of I-610, which extends off the photo from the center right, and the West End entrance/exit from I-10. The block shaped building at center left front is a pumping station, one of those used to pump water from heavy rains off city streets in more normal times. The far eastern end of Veterans Memorial Boulevard is seen just back from the interchange extending to the left. The view looks north toward Lake Pontchartrain. The stretch of ground with no buildings from the Interchange to the lake is Pontchartrain Blvd. (on the left) and West End Blvd. (on the right), with a linear park (formerly the route of the New Basin Canal) between them. Smoke can be seen rising near the lake, probably from the burning of the Southern Yacht Club building. This photo provided by the U.S. Coast Guard shows flooded roadways as the Coast Guard conducted initial Hurricane Katrina damage assessment overflights of New Orleans, Monday Aug. 29, 2005. Español: Carretera Interestatal 10 en Nueva Orleans inundada después del paso del huracán Katrina a finales de agosto de 2005. La inundación se provocó por una brecha en el dique de contención durante el paso del huracán. Türkçe: Sel altında kalan I-10/I-610/West End Bulvarlarının kesiştiği kavşak, kuzeybatı New Orleans ve Metairie, Louisiana. Esta é uma imagem retocada, o que significa que a versão original foi alterada digitalmente. Modificações: selective noise reduction. O original pode ser visto aqui: KatrinaNewOrleansFlooded.jpg. Modificações feitas por Mfield. Este ficheiro é uma imagem em destaque na Wikipédia em hebraico (תמונות מומלצות) e é considerado uma das melhores imagens.